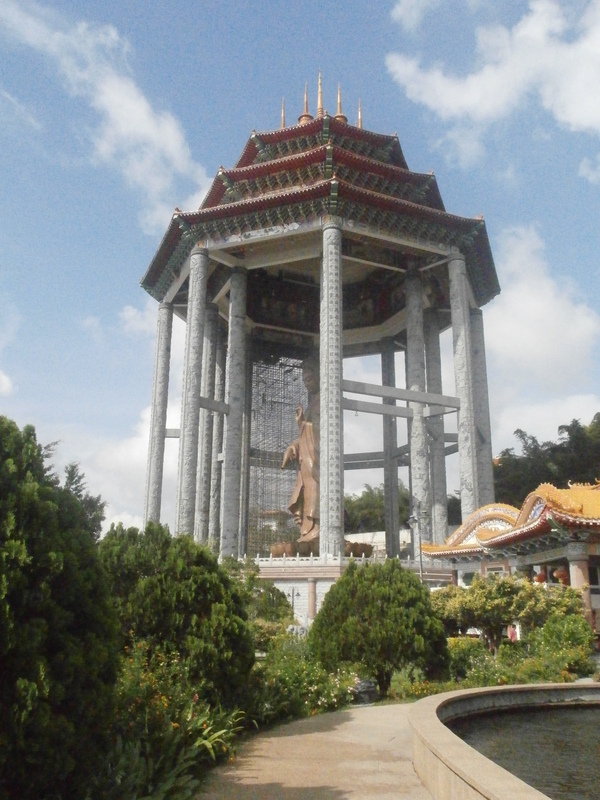 But we did go visit Kek Lok Si Temple. We took a local bus to the bottom of the hill where the temple was set. After walking past the unmarked entrance of the path through the tourist shops to the funicular, we found ourselves in a parking lot, looking around trying to figure out where to go next. We were approached by a man asking if we wanted a ride up the hill. Normally, we ignore taxi driving touts, but we listened to his offer: RM5/person to the top of the hill. We knew it would cost RM3 each for the funicular, so we decided it was worth the extra RM2 a piece to not have to wander around in the heat looking for the entrance to the funicular. 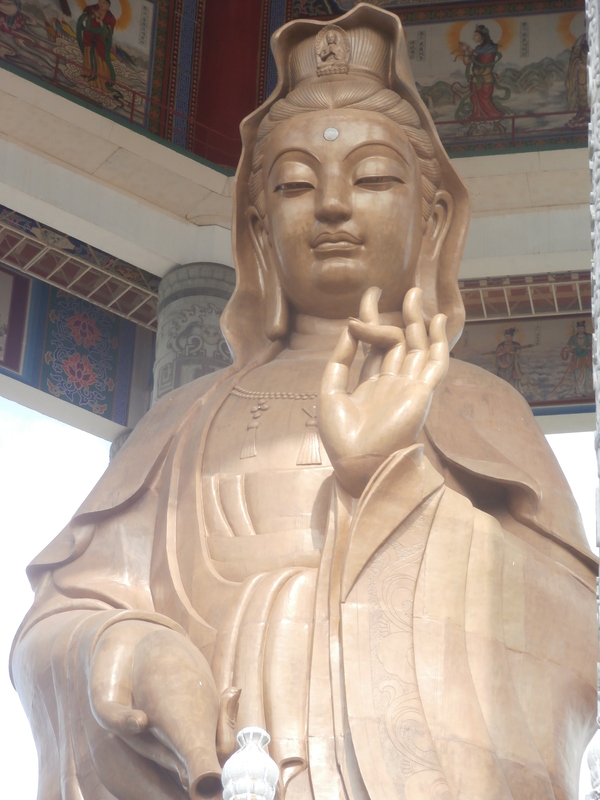 When we got to the top of the hill, we were greeted by a giant statue of Kuan Yin, the Buddhist goddess of mercy. Her size and stature was impressive. We spent some time trying to get a good picture of her. Then we wandered the grounds for a while and enjoyed the view overlooking the city. We took the funicular down, ending up on the level with a 7 story pagoda. It cost RM 2 a piece to go in. Since we were there, we decided what the heck! We wound our way up the increasingly thinner stairs, checking out the Buddha statue and view on each level. To get back down the hill, we had to wander down through sketchy and smelly (and hot) rows of tourist shops. We were glad that we opted to take the taxi up the hill. 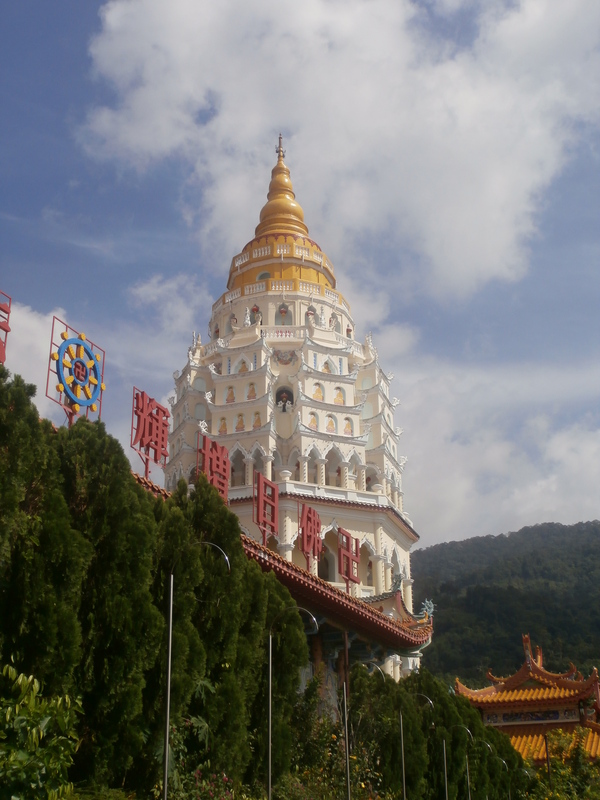 All in all, we enjoyed our break from resting to visit Kek Lok Si Temple.